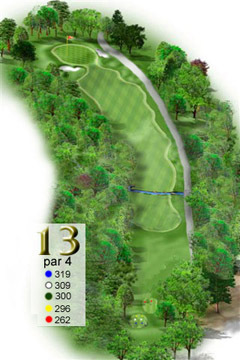 Par 4, dogleg left with lots of trouble if you don't hit it straight. A driver here is not necessary, but if you do hit it with a little draw you can get close to the green but you'd better keep it out of the trees. Both left and right are trouble and will make par difficult and a provisional tee ball could be necessary. A small stream across the fairway also could come into play if you don't get the ball up or if you don't get it all. Hit you're second shot long and again, lots of trouble with trees.